Use our design tool to create a custom tee that you will love. We have pre-built templates to help you get started! Add more products for no additional cost. We give you a base cost, then you set your selling price. You don’t pay a cent. Tell everyone what the campaign is about. Title your fundraiser, add a description and pick a timeframe for your campaign. Share with your family, friends, and supporters. Use Email, Facebook, Instagram, and Twitter to promote your fundraiser. When your campaign ends, we ship the shirts to your supporters and send the proceeds to the recipient. It’s easy and free! We are T-Shirt Obsessed individuals, passionate about Fundraisers, Partners by choice and Storytellers because of you. Focus on what you love - we’ll handle the rest. 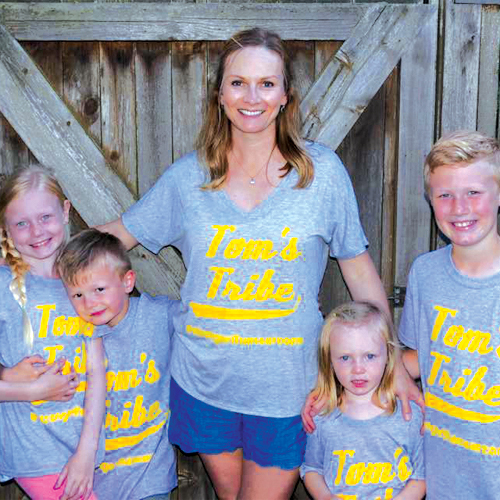 “Tom’s Tribe is ‘our people’ - friends and family who are selfless, generous, kind, compassionate humans.” Tom, a beloved family man and friend, was diagnosed with a rare cancer called Liposarcoma. In an effort to remain positive during such a negative time, dedicated wife, Erin, launched a t-shirt fundraiser to unite supporters as he fights the disease. Erin was able to keep the fundraiser a secret so supporters and loved ones could surprise Tom using the hashtags #TomsTribe and #StrongerThanSarcoma just a day before his surgery. This showed Tom the overwhelming amount of support her has in the community, and uplifted his spirits as he fights the disease.